Never miss an eat. Follow us on Pinterest! The days of long waits, at the few restaurants offering weekend-only fare, are scarce – brunch options now abound in Chicago and we take the mighty meal for granted. A recent trip to The Bristol in Bucktown reminded us why we got into the brunch game in the first place. A neighborhood restaurant; mixing old-school and energetic modern technique but never letting tradition get in the way of trying something different – and making you feel welcomed all along the way. The team at B. Hospitality Co. (Formento’s, Nonna’s, et al.) and Chef Todd Stein (who will ever forget his epic Iron Chef America battle against Bobby Flay?) know how to make Chicagoans feel comfortable…and full. Tag along as we dig into their recent brunch menu! The Bristol’s doors will be OPEN for brunch and dinner, today and tomorrow. We hope to see you before we are closed for Memorial Day! If you’ve previously visited The Bristol, the brunch drink menu is as concise and tidy as you would expect. A tight selection of classic cocktails and choice selections from their wine list, alongside espresso and juice options. We never say no to coffee and a tall glass of juice sounds refreshing on a warmer than normal day. 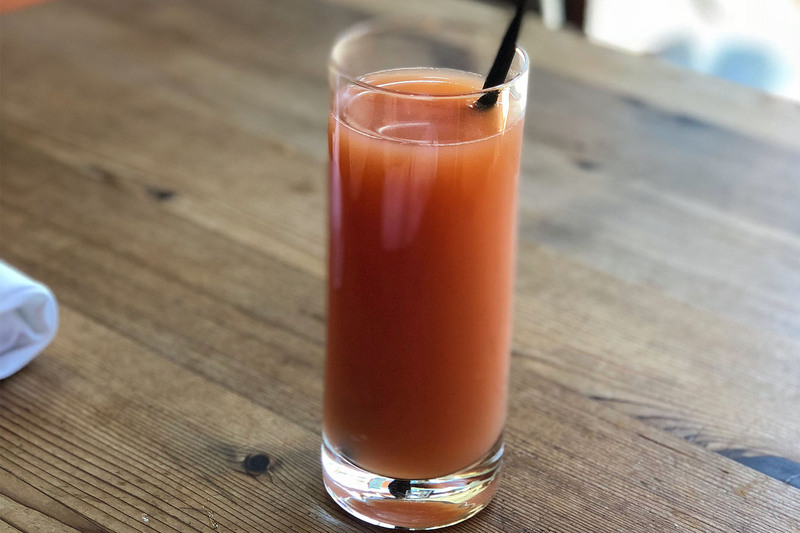 Grapefruit juice may be no-frills but its gently tart bite pairs well with a bottomless cup of black coffee. The Basque Cake with fruit jam and toasted almonds has been a menu stalwart, and for good reason. 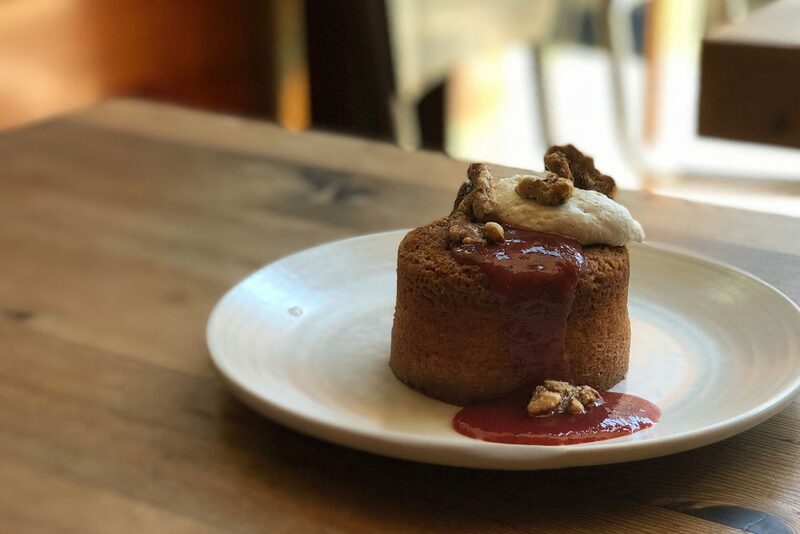 This simply plated pastry offers a dense yet bouncy cake with a seasonal jam you’ll surely consider mopping up every last bit. The pastry section of the menu also offers a coffee cake and cinnamon roll (see here) or if you’re feeling especially adventurous, a sampler of all three! We’ve noticed an increasing number of Chicago brunch menus which feel a lot more like a late breakfast and forgo the lunchier options entirely. Chef Stein would never let this happen. For every hash there is a sandwich, for every benedict there is a burger. 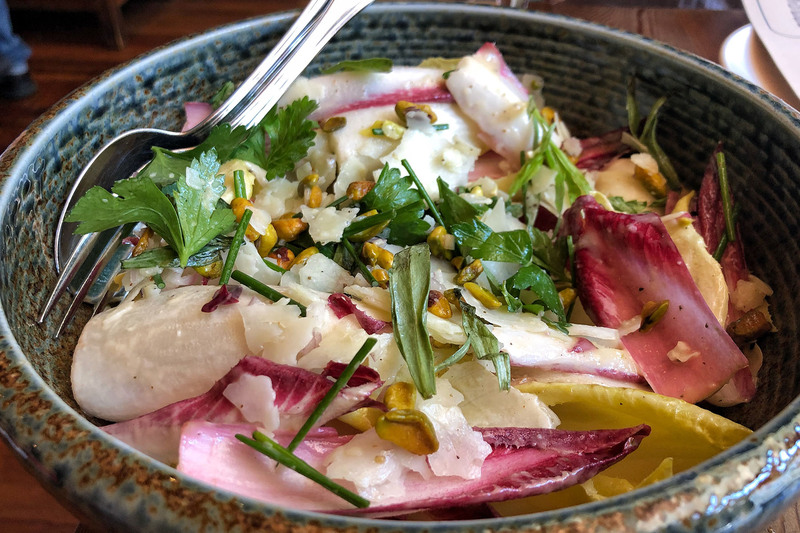 The Endive Salad not only highlights the brunch menu but has been a key component of The Bristol’s dinner service in the past year. Crisp endive is mixed with manchego cheese, toasted pistachios and a light citrus vinaigrette. If you follow Instagram, The Bristol’s Mushroom Toast has made a name for itself. Its multiple textures and yolky goodness give ‘grammers goosebumps as they scramble to snap #nofilter style pics. We can’t blame them. 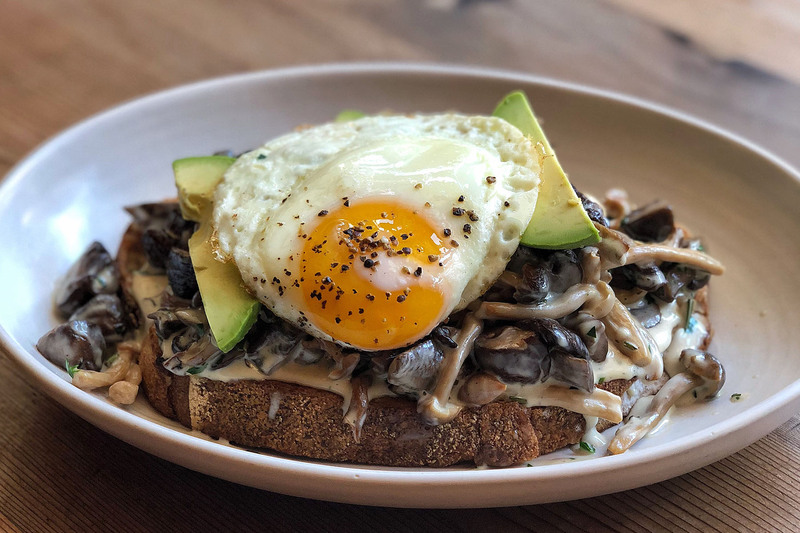 Check out the toasted sourdough loaded with mushrooms and crème fraiche, then topped with a fried egg – crispy whites included! And trust us, ask for the avocado. From here we had the option to go savory or sweet. Buttermilk Pancakes with a fruit compote never fail to satisfy but we need more eggs in our life. 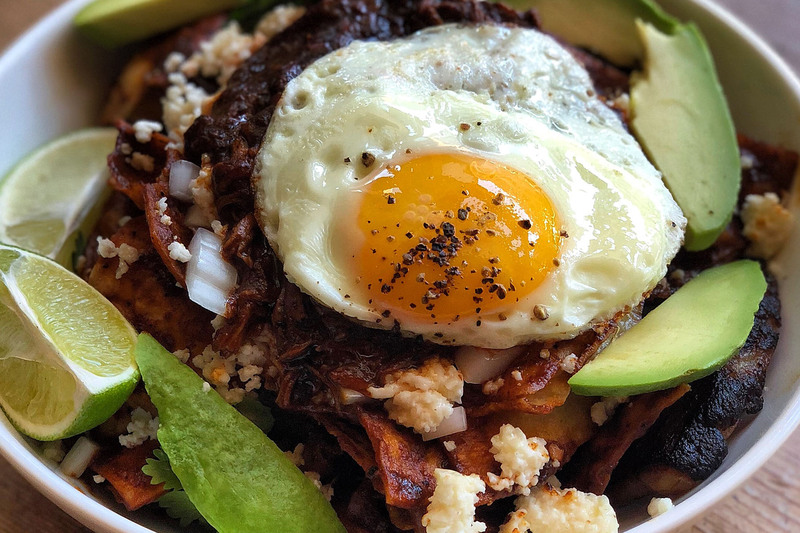 The Chilaquiles do just that and are precisely the kind of beautiful meal in a bowl that we dig. Braised pork is nestled into crispy tortilla chips then topped with queso fresco, cilantro, lime and the type of fried egg daydreams are made for. Another cup of coffee please. With the odds on a late afternoon nap increasing by the course, we take the staff recommendation and order the BLT, as our grand finale. 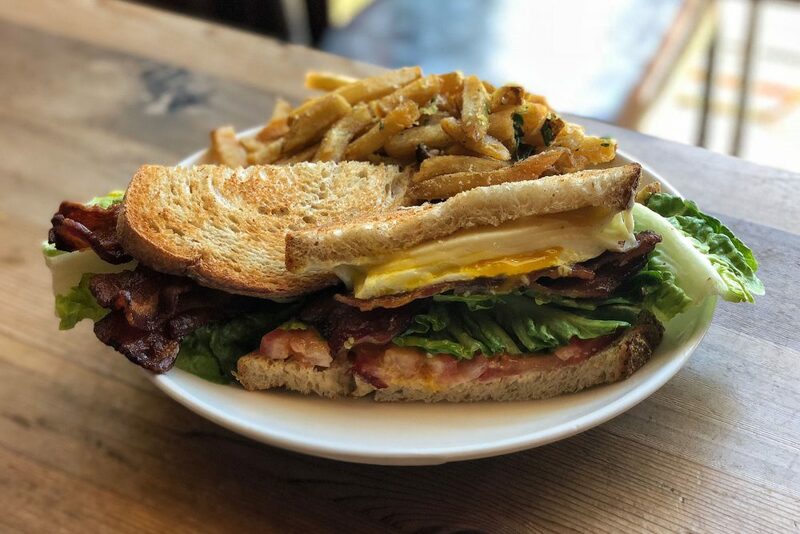 This spot-on sourdough rendition layers bacon, lettuce and tomato with cheese and a fried egg. It’s a beast. Duck fat fries provide a rich and starchy companion and help infuse lunch into our favorite culinary portmanteau. The Bristol offers brunch on both Saturday and Sunday from 10am to 2pm. The menu changes seasonally.